Adani general manager of business development Raj Guruswamy will be among the speakers highlighting more than $500 million worth of supply chain opportunities at the Gladstone Engineering Alliance Major Industry Conference. GEA chief executive officer Carli Homann said the conference was highly regarded as a key forum for current and future work opportunities, with 2017 marking the 14th year of the industry event. “In recognition of this milestone and in understanding the current needs of the market in line with the economy, GEA has continued to expand the conference scope,” Ms Homann said. 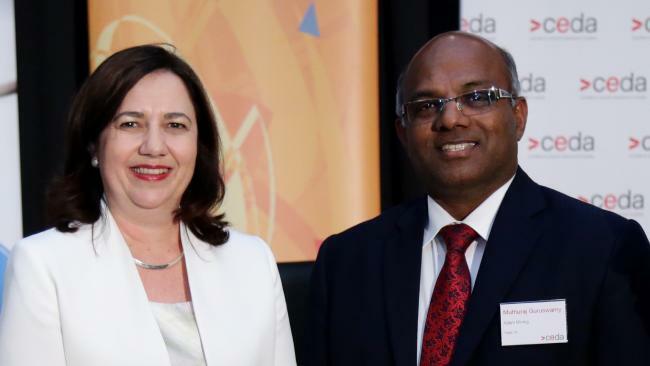 Along with Mr Guruswamy (pictured below with Queensland Premier Annastacia Palaszczuk), resource industry speakers include Moreton Resources chief executive officer Jason Elks, Carbine Resources chief executive officer Tony James and Idemitsu common category manager Adam Dickens. The conference will also cover a number of projects within the construction industry such as the Gladstone Integrated Health Precinct, Gladstone Ports Corporation’s East Shores Stage 1B project and more than $30 million worth of projects through the Gladstone Area Water Board. The 2017 GEA Major Industry Conference will be held on Thursday, October 12, at the Gladstone Entertainment and Convention Centre. GEA will also be hosting their Gala Dinner and Industry Awards night on the evening of the conference at the Gladstone Entertainment and Convention Centre.